It’s Sunday morning. Readathon just ended. I’m beat. I stayed up until almost midnight because my audiobook really drew me in. Then after I finally got in bed, the hotel shoved a paper under the door in a very loud way that sounded like something had fallen off a shelf in the bathroom. Freaked me out and I had to get myself back into sleepy mode. (This is what comes of listening to horror into the late hours of the night, though to be fair, my thoughts were less about ghosts jumping from mirrors and more about rodents in the bathroom.) Anyway, a combination of a very late night and not being able to sleep in makes for a very exhausted Manda. Hopefully I’ll get a nap this afternoon. Despite all that, I really enjoyed this Readathon. I’ll leave the details to yesterday’s post, which I kept updating throughout the day, and my Instagram feed, which thankfully I can leave in peace for a bit. (It always makes me feel weird to post multiple times a day!) The short version is that I enjoyed the book I read (Big Little Lies) and the half-an-audio (The Dead House) even if the latter kept me up late and possibly made me paranoid. And bonus – since I was at a hotel this weekend for the ‘thon, my husband and kids did one of the big jobs in our basement remodel (moving the water heater, including reworking all the plumbing/gas pipes). We all prefer they do these things when I’m not home to stress about them. Heh. Alright peeps. I’m keeping this short. Y’all have a lovely rest of your weekend! Excellent timing to have the home remodeling done in your absence! I hope the cats weren’t too upset. I haven’t read Big Little Lies but I’ve heard really good things about the HBO series, I defiantly want to watch it when it comes out on DVD. Glad you had a good weekend! I think the series might be too violent for me. The book deals with some very rough subjects, including sexual assault and domestic violence, and I’m a wuss when it comes to TV. 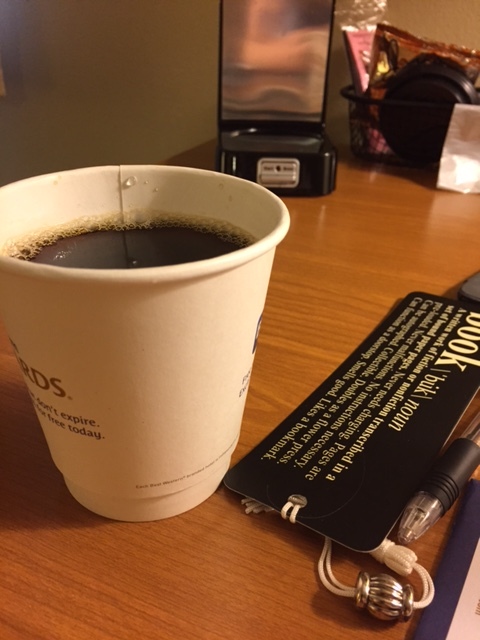 I love that you were able to do the readathon from a hotel; that is a dream of mine! And you got to avoid home repairs at the same time. That is what you call a win-win, my friend! I hope you got that nap!